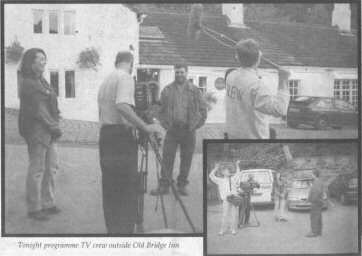 Yorkshire Television crews were at the Old Bridge Inn, Ripponden last weekend filming for a new series to be shown in September. Ian Clayton, of YTV's "Tonight" programme, brought his production crew to the pub to film and inter-view members of the Old Bridge inn Pork Pie Appreciation Society (OBIPPAS) at their weekly meeting. The television company was filming in and around the village of Ripponden during most of the day and, in the evening, Ian Clayton, presenter of "Tonight". YTV's regional magazine, took the crew inside the pub. The programme is shoot-ing a series of films about public houses, where unusual clubs or societies meet. lan first came across the "Pie Club" at the beginning of April this year when he was invited by OBIPPAS to be a celebrity Judge at its annual Pork Pie Championships, after which he vowed to return with a camera. Founded in 1984, the society, meets in the same "reserved" corner of the Old Bridge Inn every Saturday evening and is as strange and secretive as the pub itself. The Old Bridge Inn must be one of only a few in the country which carries no indication at all that it is a public house and at the bar there are no pump-clips on the rows of hand pumps (other than the guest beer of the week) to indicate the choice of traditional beers on offer.